Living in Madison is great, but as an incoming freshman, it may be a little dismaying to hear about the intense bar scene. It can be easy to feel left out when it seems like everyone is hanging out at the bars Thursday through Friday. Something I think college students overlook is the awesome food scene Madison has to offer. My favorite activity is eating, obviously, so trying the different restaurants on State Street and downtown Madison become a frequent evening activity of me. Plus, you get to be surrounded by the Madison nightlife even if you can’t go to the bars. From my extensive research, here are my three favorite Madison restaurants! DLUX. Although a little pricy, this restaurant is amazing. There is nothing like a juicy burger, savory sweet potato fries, and a creamy milkshake after a hard week of classes. Maharana Indian Restaurant. This place has incredible Indian food, and the best part is their lunch buffet for when your Saturday night calls for a Sunday brunch. Just make sure you didn’t leave too much homework to do because I guarantee you’ll be in a food coma for at least a few hours. Brocach Irish Pub. With two convenient Madison locations, this place is great for relieving yourself of the monotonous dining hall meals. The only advice I have is to get the funnel cake fries. They will change your life. Well, there you have it! 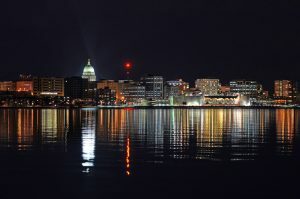 My three favorite restaurants to go to in Madison for a fun night out! What are yours? Leave a comment! Welcome to the Campus Survival Guide, brought to you by J175!